12 December 2016. A pharmaceutical company and health care venture investor are forming BlueRock Therapeutics, a biotechnology enterprise to design regenerative medicine treatments with stem cells. BlueRock Therapeutics is a joint venture of Bayer LifeScience Center in Leverkusen, Germany and Versant Ventures in New York that are providing the new company with $225 million in its first round of financing. BlueRock Therapeutics — which plans to operate labs in Toronto, New York, and Boston — will develop new treatments based on research conducted with induced pluripotent stem cells. These stem cells are derived from skin or blood cells, and reprogrammed to an embryonic state, allowing them to differentiate or transform into a wide range of cell and tissue types in the human body. 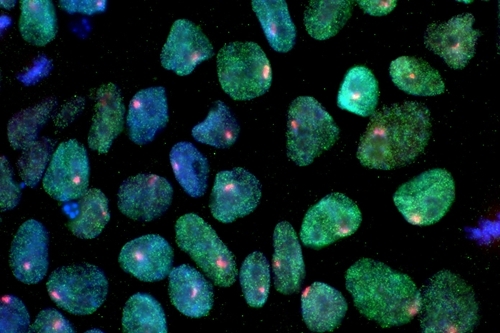 Induced pluripotent stem cells are sometimes called adult stem cells, in contrast to embryonic stem cells that first require formation of a human embryo. BlueRock is licensing its basic stem cell technology from iPS Academia Japan, a technology transfer unit of Kyoto University, the home of Shinya Yamanaka, a pioneer in the reprogramming of induced pluripotent stem cells and 2012 Nobel laureate. This license is expected to give BlueRock the ability to produce a wide range stem cell-based therapies. Among the company’s first treatment targets is regenerating heart muscle tissue to repair damage from heart attacks and chronic heart failure. One of the scientific founders of BlueRock is Gordon Keller, a stem cell researcher with McEwen Centre for Regenerative Medicine and University Health Network in Toronto. Keller and colleagues study the ability of stem cells to transform into cardiomyocytes, cells that provide the contracting ability in heart muscles. The company aims to develop treatments from stem cells that restore the electrical and muscular functions of heart tissue damaged by heart disease. BlueRock plans as well to derive treatments from stem cells for neurological disorders. Lorenz Studer, another of the company’s scientific founders, studies the transformation of stem cells into neurons. Studer is director of stem cell biology at Memorial Sloan Kettering Cancer Center in New York, where he and colleagues investigate production of neurons that create dopamine. A potential therapy for Parkinson’s disease is stem cells to produce and replace impaired with functioning neurons. In addition, BlueRock plans to collaborate with stem cell manufacturing specialists at Centre for Commercialization of Regenerative Medicine in Toronto to produce stem cells for treatments. The company’s board at the outset will be comprised of Juergen Eckhardt and Axel Bouchon from Bayer, and Brad Bolzon and Jerel Davis from Versant Ventures. “We have closely tracked the field of regenerative medicine for the past five years,” says Versant’s Davis in a joint statement, “and believe the time is right to invest in stem cell therapies given recent breakthroughs in cell differentiation, manufacturing, and engineering.” Bayer and Versant plan to back their bet with an initial financing of $225 million. The funds are expected to support BlueRock for 4 years, with treatments designed in that time to reach clinical testing. The founding companies say it is one of the largest first-round financing packages for a biotechnology enterprise.